The 1961 mint set arrived with five coins from the Denver mint and five from the Philadelphia mint. In the 1961 mint set, six of the ten coins - the two dimes, two quarters and two half dollars - contained 90% silver. Two pliofilm sleeves, one edged in blue and one in red, held the ten uncirculated coins, five from the Philadelphia mint and five from the Denver mint. 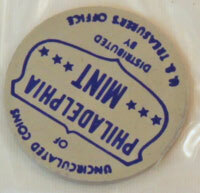 The 1961 mint set came in a yellow envelope that held the two sleeves of uncirculated coins. 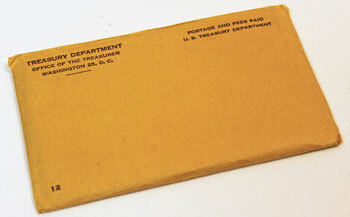 The upper left corner on the front of the envelope shows "Treasury Department," "Office of the Treasurer," and the Washington address. The upper right states, "Postage and Fees Paid US Treasury Department." The lower left of the envelope simply notes a number 12. Two pieces of cardstock sandwich the two pliofilm sleeves holding the ten uncirculated coins inside the envelope. Quite a number of the 1961 Mint Sets traveled through the postal service in these envelopes. The red edged pliofilm on the left contains the five coins minted in Denver along with a gray token printed with red ink identifying the mint. The second pliofilm on the right with its dark blue edges holds the five coins minted in Philadelphia and the gray token printed in blue showing the mint. 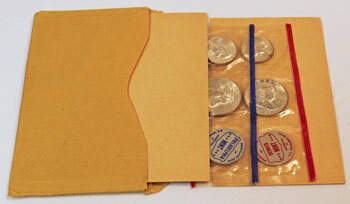 The 1961 mint set's pliofilm sleeves hold the uncirculated coins in their individual compartments. The uncirculated coins move freely within their protective film. The coins' reverse images can be readily seen through the clear pliofilm. The gray tokens for each mint have the same printing on the front and the back. 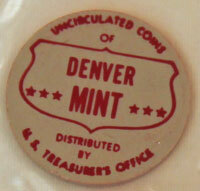 The red printed token in the 1961 mint set identifies that sleeve as "Uncirculated Coins of Denver Mint Distributed by U.S. Treasurer's Office." Similarly, the blue printed token in the dark blue edged pliofilm sleeve shows "Uncirculated Coins of Philadelphia Mint Distributed by U.S. Treasurer's Office." The 1961 Mint Set contains 1.22974 troy ounces of silver with the three 90% silver coins in each pliofilm sleeve equal to 0.61487 troy ounce of pure silver. By mid-1963, if the present trends continue, the Treasury Department will lose its long-standing power to dictate the international price of silver. An increase in the price of silver will increase jewelry and photographic film costs. Some countries may choose to melt their silver coins that are worth more as silver than as their coinage face value. Though the Treasury shows the amount of coins available has increased, Federal Reserve Banks in New York, Boston and Philadelphia are rationing penny shipments to commercial banks in their area. The US Mint states they expect no serious shortages nationally, at least until the Easter buying season. Confederate half dollars, part of a centennial celebration, quickly sold out. The Charleston Civil War Centennial Commission plans to order 10,000 more of the coins. One side is a reproduction of an actual Civil War half dollar with the other side explaining how to redeem. Merchants participating in the promotion will accept the coins as legal tender through April 12. Afterwards, the centennial celebration confederate coins will be monetarily worthless. Eva B. Adams was confirmed by the Senate on Saturday as Director of the US Mint. A native of Nevada, Miss Adams has been in Washington, DC since 1940. Most recently, she served as the administrative assistant to Senator Alan Bible. Before coming to Washington, she was the assistant dean of women at the University of Nevada in Reno. The New Frontier is said to have a blind spot where women are concerned. To date, President Kennedy has appointed only a small number of women to the top positions in his administration. But, both Democrats and Republicans are happy with his appointment of Eva Adams to be the new Director of the Mint. With tongue-in-cheek, she told her many friends, "No samples." President Kennedy announced Tuesday a decision to end federal sales of silver - an action expected to result in an immediate increase in the price of the metal. Kennedy also called for the gradual removal of silver backing from part of the nation's paper money. This would take 25 to 30 years and require congressional approval. Silver and gold - paper money and credit - the seesaw relationship of the US dollar to the British pound and Canadian dollar and the German mark and the Swiss franc. These are all parts of the big international monetary problem that the central bankers of the Western world are trying to solve. Canada is buying millions of United States pennies so Ontario shoppers can pay the new Ontario sales tax. Overtime at the Royal Mint failed to meet the demand. The 1961 Mint Set Year included news of world currency issues, changes in silver, a new mint director and another shortage of pennies.